So, I broke down this summer and bought them... a set of popsicle molds. I've been contemplating them for years, but kept thinking that "I could just use paper cups" or something. 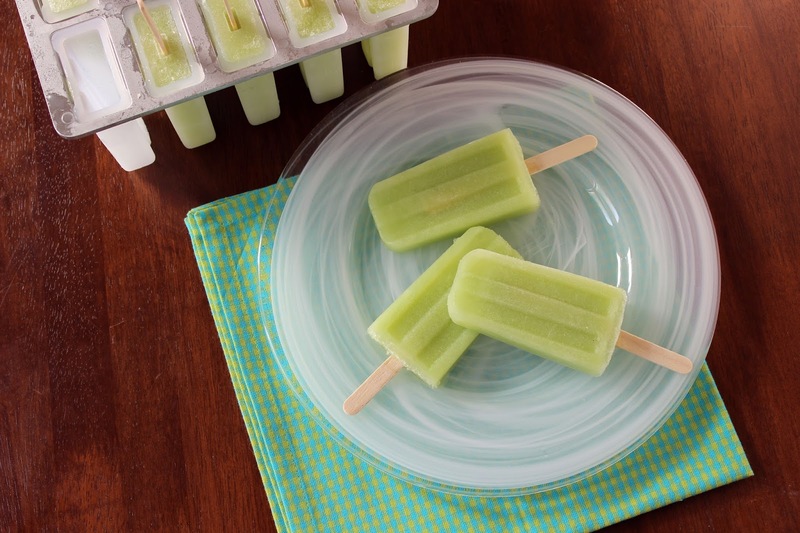 The truth is, having ACTUAL popsicle molds makes a difference. Previously, I'd talk myself out of making popsicles, since the thought of finding a place in the freezer for a zillion little cups was... less than inspiring. And buying a mold that holds the wooden sticks upright is also a big plus, as far as I'm concerned. So I did it. I bought the Norpro mold I'd been eye-ing up. It wasn't the costliest model. It may not be the most awesome (after all, they make those Zoku popsicle molds that freeze in 15 minutes). But, the truth is, I don't need instant gratification in my popsicles; I'm an adult, and I can wait a few hours. Sure, the smaller ice crystals would be nice. But, my ordinary old-fashioned popsicle tray works for a number of reasons. It was affordable. Less than $15. The mold is dishwasher safe. It holds the popsicle sticks straight upright. The popsicles remain upright in the freezer (and don't make a big mess). Our first try at popsicles was a raging success. 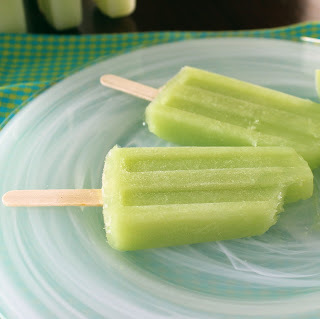 Cucumber popsicles are delicious. And refreshing. And a splash of tequila makes them deliciously adult... I can't take all the credit. After all, Peef went through the work of making them while I was spending the day with a girlfriend. (Side note: I LOVE having a husband who makes me icy treats while I'm off shopping). They're delicious too. The lemon verbena is awesome here, though I could see this working with a number of flavors, including lemon balm, cilantro, or tarragon). I am now officially excited to play around with differently flavored icy treats. Next up (I hope) is to conquer one of my all-time favorite treats, the fudgesicle. Alright, alright. So, this is the worst possible time to post this recipe. It's hot. It's humid. 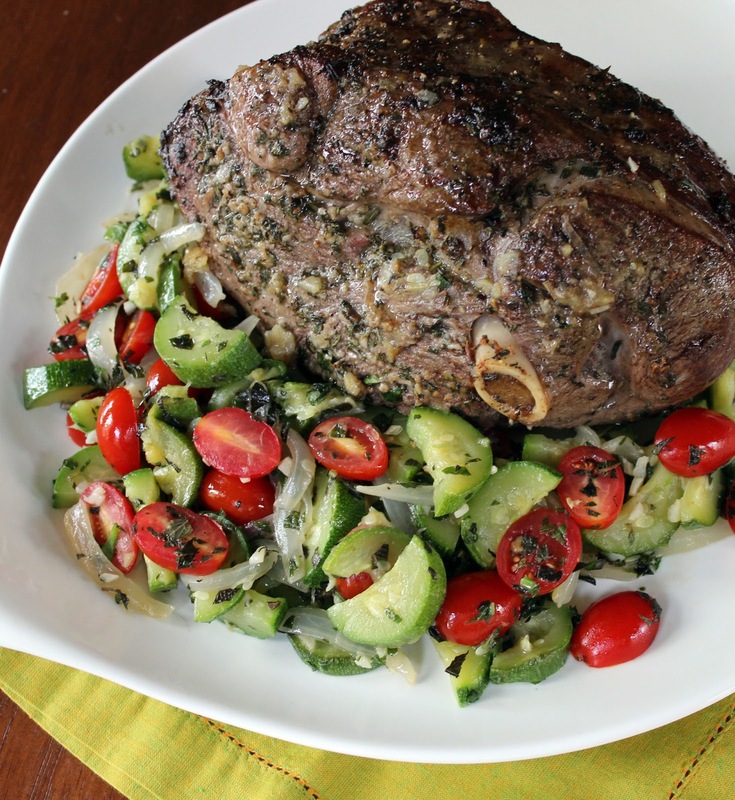 And the last thing you want to do is turn on your oven to roast a leg of lamb. I understand. But, I can assure you that you'll want to bookmark it for another occasion -- or pin it to your Pinterest page. Because it's easy. And delicious. And the leftovers will give you fodder for some of the best lamb pitas you've ever eaten in your life. 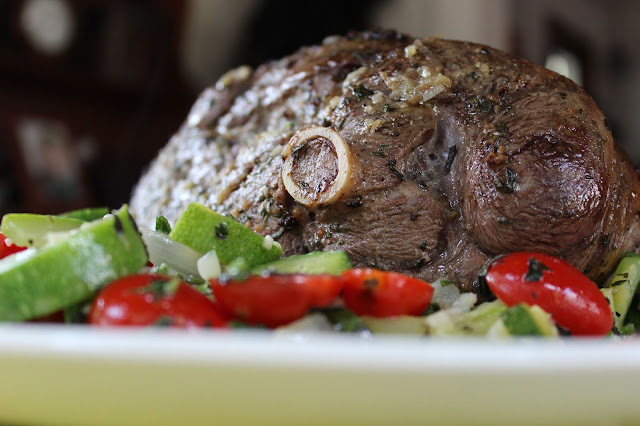 Meet the garlic and rosemary infused leg of lamb -- one of the simplest and best recipes I've created in a long while. Best of all, you probably don't need to measure anything. I used a relatively small leg section for this recipe. It weighed about three pounds, which means that, at 20 minutes per pound, it took just over an hour to cook (I shot for an internal temperature of about 135, which is medium rare; you can go slightly higher if you want, but I'd encourage you not to overcook it). The size of the leg isn't all that important here. But, the shape of the leg is. You want a piece of leg that is approximately the same thickness all over -- which means it will cook evenly. Equally as important is the rub, which you want to apply to the lamb the day before you roast it. For my leg, I used about six garlic cloves, about 2 tablespoons chopped fresh rosemary, a teaspoon or so of salt, lots of freshly ground pepper, a splash of red wine vinegar, and an equivalent splash of olive oil. You'll mix it altogether into a loose paste, and then rub it all over the lamb. Be sure you poke a few holes in the fat and get the rub into all the nooks and crannies... you'll thank me later. After the leg marinates overnight, you'll want to heat up some butter over medium-high heat in a large oven-proof skillet. When it melts and the foam subsides, you'll want to brown the lamb shank on all sides. While it's browning, you can preheat your oven to 350F. When the lamb is browned, pop it right into the oven and leave it for around an hour, probing it with a thermometer to check its internal temperature for doneness. Then, before carving, let it rest for 10-15 minutes. It will be the longest 10-15 minutes of your life... but I assure you, it's worth it. Serve up with a nice saute of summer zucchini, onions, and cherry tomatoes sprinkled with fresh oregano and mint. Makes you smile just thinking about it, doesn't it? And for a moment, I'll bet you forgot all about the heat wave... at least we hope so! Milwaukee is known as the City of Festivals for good reason. In addition to the world's largest music festival, Summerfest, Milwaukee is also privileged to be the host of some of the world's best ethnic festivals. One of the tastiest just happens to be Festa Italiana, coming up on July 19-21 (stay tuned below for a chance to win tickets). Among its other claims to fame, Festa happens to be largest Italian event of its kind in America today. 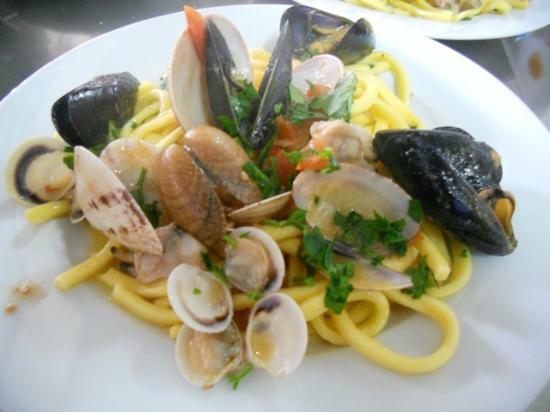 Last year, I wrote a guide to "eating your way through Festa." This year, I had the opportunity to interview Maria Liberati, former international supermodel, blogger, cookbook author and food and travel writer for The Mortan Report. Interestingly, during the height of her modeling career while jet-setting around Europe, Liberati rediscovered the simplicity of Italian food while spending time at her family's vineyard in the mountains of central Italy. She began to experience the real tastes of food that she knew from her childhood. And she created an entirely new career based around her love of Italian food. Today, Libearti is considered one of the foremost experts in Italian cuisine, culinary travel, wine and culture and has been referred to on occasion as the "Italian Martha Stewart." I was curious to find out more about Liberati's cooking philosophy, as well as her impressions of Milwaukee and Festa Italiana. Here's what she told me. She was also kind enough to leave me with a deliciously simple recipe for a great summer appetizer. In turn, I'm sharing that with you. In addition, if you happen to be around for Festa Italiana in Milwaukee this year, be sure you read to the bottom of the post and enter to win a pair of tickets to the festival (a $26 value). Wash basil leaves thoroughly and pat dry. In a large skillet, sauté the shallots and tomatoes in oil for 3 minutes. Add diced scallops and shrimp and mix thoroughly; sauté for 3 minutes. Pour the pesto sauce over the seafood, toss, and sauté for another 5 minutes. Serve warm or cold over radicchio leaves. In celebration of Festa Italiana, we'll be giving away pairs of tickets to two (2) lucky readers! For your chance to win, head over to OnMilwaukee.com and check out my interview with Maria Liberati. Then come back and leave us a message telling us what most surprised you about the interview. Giveaway ends on Sunday, July 14, 2013 at 11:59 p.m. Tickets will be mailed to the winners on July 15th, or as soon as we have accurate mailing information for the chosen winners. Winners will be chosen at random and notified by email, so please leave your email addy with your comment if it's not included with your Blogger profile. Entries from the U.S. only, please (and please only enter if you know that you can make it to Festa Italiana in Milwaukee on July 19-21). Full Disclosure: This giveaway is sponsored by Festa Italiana, who provided us with the product for our giveaway. However, all opinions expressed in this post are our own.